Desktop vaporizers can cost a little much, the Vapir Rise 2.0 is an affordable solution. I’ve come across a pattern in desktop vapes. They’re hit or miss. They either perform well, but malfunction due to maintenance glitches (like the Zephyr Ion), or they’re absolutely flawless (like The Volcano by Storz & Bickel). I haven’t found much in between – until now. Unboxing the Vapir Rise nearly gave me an anxiety attack; I felt like I was opening a complex chemistry set with a jumble of intricate attachments. If you’re new to desktop vaporizers, the Vapir Rise’s Quick-Start Guide is easy to follow – even with all the attachments. After a cursory read-through, I was ready to fire it up. My first observation about the Vapir Rise concerns its balloon system. After powering up and boosting the fan’s speed to the maximum setting (quite loud, by the way), I noticed it took about 2-3 minutes to fill up a bag. This was unexpectedly slow. But, I was hoping the quality of the vapor would shut me up. The first pull out of the bag was like sucking hot air out of a plastic balloon. Yes, it literally tasted like hot plastic balloon. From there, I knew the bag system was something I wasn’t willing to try again. With that bad, hot plastic taste in my mouth, I gave the direct whip (silicon tubing) a try. I switched out the adapter, put my tube in place, and set the appropriate fan level. This is where the Vapir Rise shines. I was able to get some monstrous pulls, something that was lacking with the balloon system. When it came to the flavor, I’m not going to lie: the first couple of drags did give a somewhat mild taste of silicon, but after a few pulls, it dissipated. One of the best parts of the whip system is that you’re able to maintain how much vapor you want to inhale. The fan is also great when when you’re starting your session; after some tinkering, I found that turning it off halfway gives you a better experience. 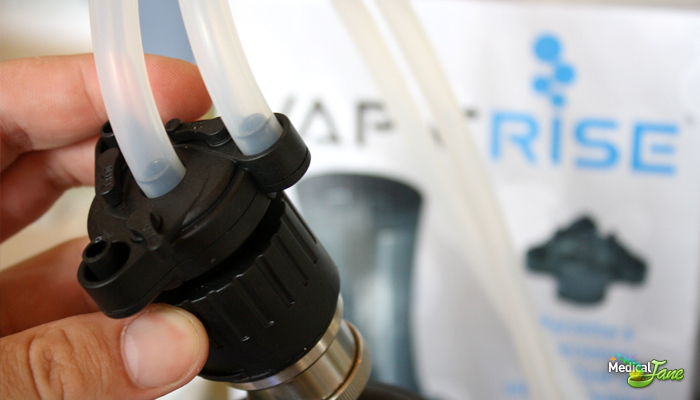 Vapir Rise’s multi-user adapter lets up to four people hit the device at once. Although I like the idea of sharing the vape, setting it up for this many users was too much work. Instead, my partner and I gave it a whirl. It worked remarkably well – you just have to take turns. I found that inhaling at the same time ate up a sizeable portion of vapor, thus giving a poor end-result. This could be an ideal vaporizer for anyone just starting out. It’s cheap, easy to use, offers a simple interface, and provides some satisfying results – as long as you’re not vaping from the bag. That said, if you’re serious about vaping, I’d recommend saving your money for something more durable. I can’t see the Vapir Rise pulling its weight for any significant stretch of time – you’ll probably be looking for a new vape before the year is out.